Dark hulls loosening from kernels during the hominy processing. 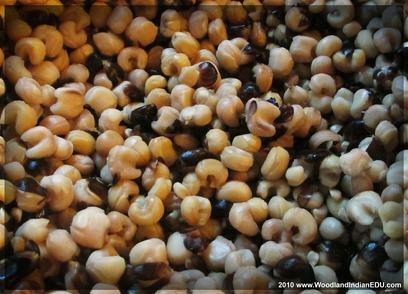 Hominy (also known as "hulled corn" in some traditional Native cooking), a dish attributed to classic Southern American cuisine, is actually an original food of the Native Peoples of the Woodlands region. The word hominy is derived from the Virginia Indian term "rockahominy” possibly referring to corn or parched corn meal. It was shortened to "hominy," creating the popular term we use today. Hominy, or hulled corn, is corn treated with alkali, traditionally made of ash. 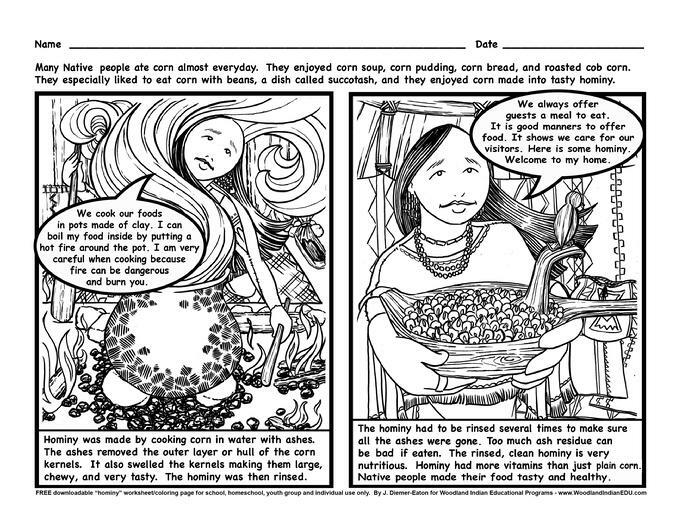 Native Peoples used lye made of ash water to soften or burn the hulls of corn kernels. This treatment is known as nixtamalization. Today, food producers use sodium hydroxide and other types of lye chemicals in place of ash alkali, and calcium oxide (quicklime) in Mexican hominy and tortilla cornmeal. The Eastern Woodland Peoples treated their corn (predominantly that of eastern 8-row variety by AD1200) with alkali for many reasons, most noticeably for taste. The process imparted a pleasant flavor. It also softened flint corns, a variety whose name conveys the hardness of this strain. Eastern 8-Row Corn, some known as Northern Flint corns, were a popular corn variety among the northeastern tribes – many small 8-row flint corns being quicker to mature, giving Native farmers the ability to cultivate corn in regions with shorter growing seasons such as the northern of the Great Lakes and New England (such 8-row corns were grown as far north as Ontario, Canada by AD800). Making corn into hominy also boosted its nutritional value for humans, humans being unable to absorb all of corn’s nutrients as is (although technically the process hurt the overall nutritional value of the corn itself). These "Flint" corns were in fact hard... the pericarp being a very hard shell to break down. But treating the corn with lye and softening or slipping the hull, made it easier for humans to consume this rather hard corn variety. And the alkali bath helped to release lysine and tryptophan amino acids and niacin (niacin being a member of the vitamin B complex) in the corn, presenting more nutrients that can be digested and absorbed when consumed. Lack of niacin in a diet, such as one based so much on corn consumption, can lead to diseases like pellagra (a disease caused by a dietary deficiency of niacin, causing many complications including disorders of the central nervous system). Clean hardwood ashes, ready to make a lye from to soak corn in. In one methods, the corn is directly soaked in the water and ash mixture. The other method was run water through ashes, creating a strong lye water, then soaking corn in the strained lye solution. 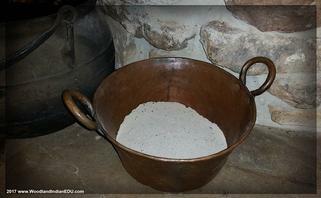 The basic process of hominy making in eastern Native America started with the alkali. Hardwood ashes were documented as prime material to make the lye solution. The ashes were mixed with water (or as sometimes seen today by Native cooks, water was strained through ash to create a lye water to use with no muddy ash clumbs in it), and the solution heated with the corn kernels. For some, just heating the mixture was enough to make hominy, while others insisted on beating the corn and ash mixture with pestles to agitate the kernels (often the whole kernels were cracked in this process, as was noted to be done by Iroquois/Haudenosaunee cooks). After a time, the ash-lye burned away at the hull (loosening it) and swelled the kernels' starchy interior. It also killed the seeds’ germs, which insured the corn would not spoil by sprouting, allowing dried hominy to be stored easily for long periods. 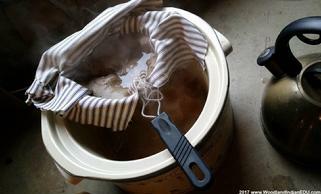 The lye water was then discarded, and the hominy was rinsed several times to rid it of extra lye residues. This was often done in baskets made just for the job of hominy rinsing, accomplished by either pouring water over the hominy-filled sieve or lowering the basket with its contents into the gentle current of a stream or river. A little bit ashes were fine to ingest (some might even say good for seasoning, in fact, some did use a sprinkle of ash in foods for seasoning), but large amounts that created a lye is harmful if consumed. The clean hominy could then be prepared for a meal right away, or dried for later use. The author makes hominy from heritage Miami 8-Row Corn... Left: the corn kernels freshly separated from the cobs, and Right: the finished hominy made from those kernels being rinsed. 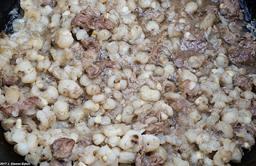 Miami White Corn hominy cooked with deer meat during WIEP educational foodways program. Hominy/hulled corn was boiled and eaten alone, or flavored with animal fat. This was not only a favored dish of the Woodland Indian Peoples, but was reported to be a usual daily dish for many voyagers. While in the field, the traders boiled a quart or so of prepared hominy for a couple hours, and flavored it with animal fat (and sometimes salt, should they have a pinch). The Native Peoples also combined hominy with other ingredients like beans and pieces of meat. One Cherokee tradition calls for cooking hominy in kanuchi – a traditional hickory nut broth. Soft whole hominy was sometimes mashed and eaten as a hominy pudding, or baked in cornhusk envelopes, or shaped into patties that were shallow fried in grease (some Native bean bread recipes call for hominy paste as its cornmeal base). Some Southeastern Native dishes, like sofkee, called for ash-treated corn as the main ingredient. 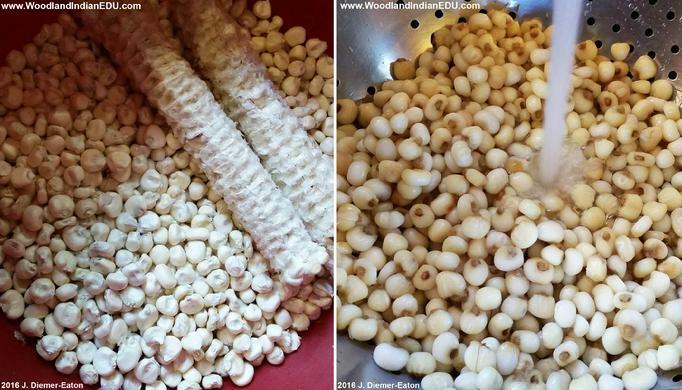 Hominy, dried for later use, could be hydrated and eaten whole - one Delaware/Lenape source insists the water from cooking dried hominy should be discarded a few times to improve the taste. Or the dried hominy could be ground into meal. Hominy meal made a Native pudding-like dish know today as grits (it's worth noting that grits isn't just coarse ground cornmeal... it is "treated" cornmeal, ie meal made of hominy - this is the basic taste and texture difference between today's grits and polenta,... the former using hominy meal, the second using basic ground cornmeal). Fine hominy meal was used just the same as dry cornmeal in some cornbreads, and although such use of this ingredient was prevalent in the east, it is the Mexican-Indian tortillas that most associate with alkali-treated cornmeal. Hominy or meal made of hulled corn, ie grits, gave cornmeal dishes a sticky texture that worked well to form cakes, plus a pleasant taste. -"Societies in Eclipse: Archaeology of the Eastern Woodlands Indians, A.D. 1400-1700," edited by David S. Brose, C. Wesley Cowan, and Robert C. Mainfort Jr.
Click on the image above, or PDF icon to the right, to download the coloring page above. 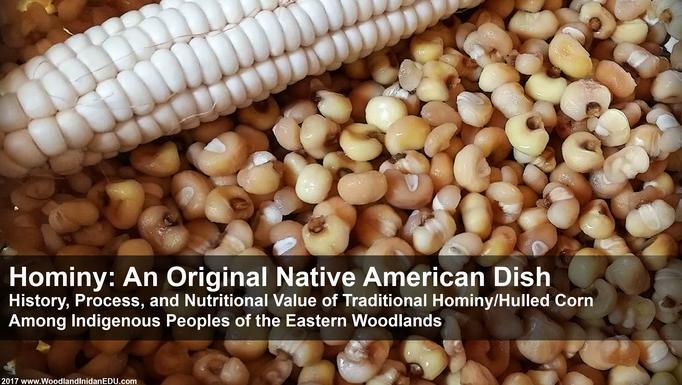 This free downloadable about Native American hominy, is intended for school, homeschool, youth group, or individual use only. This page has been adapted from our book "The First Peoples of Ohio and Indiana."